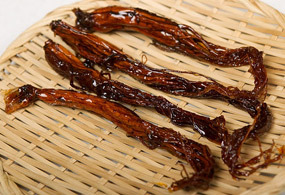 Jeonggwa is a traditional Korean desert prepared by boiling down dried fruits or edible health plant roots in honey. 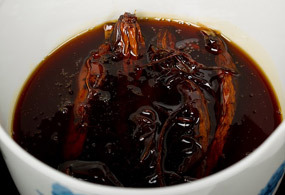 The sweet treat, which was developed as early as during the Joseon era, was usually braised with honey because sugar was very rare. 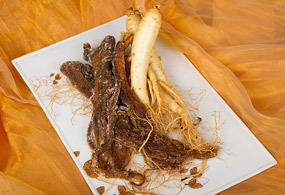 Ginseng is known as ‘insam’ in Korean, and making insam-jeonggwa was a very effective way to preserve the wholesome ginseng roots for a long time. Therefore, it was considered a health snack that was also served for important guests. 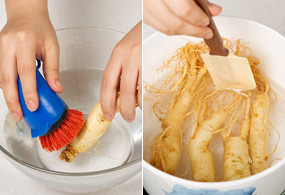 Clean the ginseng with fine rootlets thoroughly with a soft brush to remove the dirt. Blanch them slightly in three cups of boiling water with salt. 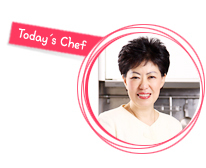 In one cup of ginseng-boiled water, add starch syrup and sugar and bring to a boil. Add the ginseng and when it starts boiling again, reduce the gas to low heat and braise them down for about 8-10 hours. - Keep the lid on for the first three hours on medium gas to fully cook the ginseng. - After three hours, reduce to a very low heat and slightly open the lid. Stir to prevent the ingredients from burning. After 8 hours, turn off the gas; add honey to glaze the ginseng. Take out the sweetened ginseng and place side by side on a wicker tray to remove moisture. Dry them for 1-2 days in a place with good ventilation. Sprinkle sugar to prevent them from sticking to each other. Make jujube flowers for garnish. 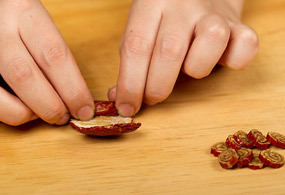 - Make a slit into the jujubes and seed them as you turn the fruit around. - Coat the inside with sugar and flatten them with a roller. - Roll them up as you press them with your hands; slice them thinly crosswise. Present the insam-jeonggwa on a plate and top with jujube garnish. ☑ Pick thick-rounded ginseng with a lot of fine rootlets that are about 8-years-old. 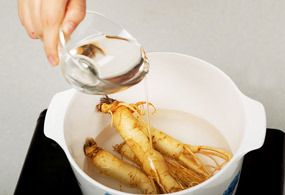 ☑ Add salt to the boiling water to blanch ginseng, which will keep the saponin component of the health root from disappearing. The spice could also slightly flavor the ginseng. ☑ The saponin element in ginseng will be destroyed if it comes into contact with metal. So avoid using pots made with metal. It’s better to use a ceramic pot or those made with glass. ☑ Do not stir once the sugar is added, otherwise the mix will crystallize and white lumps will form. 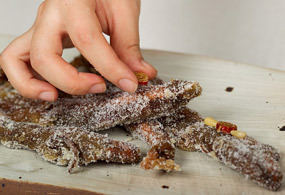 ☑ Adding honey at the last step will not only add a glaze to the candied ginseng but will also enhance the flavor coupled with the aroma of honey.